Indra Nooyi is stepping aside amid signs of a turnaround in PepsiCo Inc.’s drinks business. The company’s struggling North American beverage unit returned to growth in the third quarter, helping the company beat earnings estimates as the longtime CEO hands the reins to deputy Ramon Laguarta on Oct. 3. The maker of Mountain Dew and Tostitos also got a boost from its Frito-Lay unit, the salty-snack powerhouse that has buoyed Pepsi amid a drop in soda consumption. PepsiCo Inc. ranks No. 1 on the Transport Topics Top 100 list of private carriers in North America. “The portfolio continues to work very well,” Chief Financial Officer Hugh Johnston said in an interview. A lower tax rate helped boost core earnings per share to $1.59, 2 cents above the average prediction from analysts. Pepsi warned that full-year core earnings per share would be $5.65, down from its prior expectation of $5.70, citing the strong dollar. 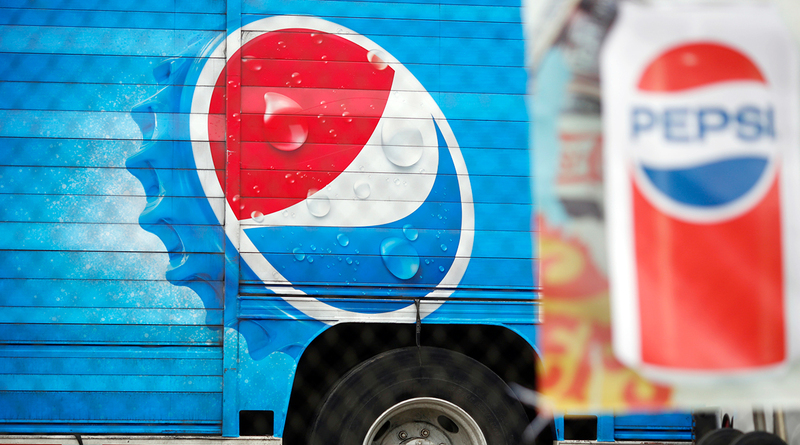 PepsiCo’s shares were little changed in early trading Oct. 2. They had fallen 7.7% this year through Oct. 1, while Coca-Cola Co. rose 0.8%. Amid its recent slump, Nooyi has vowed to fix the beverage unit. The key business has been a sore spot for Pepsi as consumers increasingly turn away from sugary drinks. Besides pursuing cost cuts to boost profit, Nooyi has diversified the company’s portfolio, adding healthier options to adapt to changing preferences. In the quarter, Pepsi’s key drinks business got a boost from core brands including Pepsi, Mountain Dew and Gatorade. Still, operating profit slipped 14% in the quarter as the unit continued to be battered by higher aluminum and freight costs. Frito-Lay also is paying more to transport its products, part of a broad hike in freight expenses that has hampered U.S. consumer companies. Pepsi is raising prices on its drinks and snacks to offset the higher costs, Johnston said. He added that Pepsi imports some aluminum from Canada and still is trying to ascertain whether the new trade deal among the United States, Canada and Mexico will lower prices. The company said that increased marketing spending this year amid intense competition with Coca-Cola had started to pay off with higher sales. Pepsi will continue with its increased advertising spending as it tries to fend off its longtime rival, according to Johnston. Nooyi announced in August that she would step down as CEO, ending a 12-year run at the helm of the food and beverage giant. She’ll remain chairman until early next year. Born in India, she was PepsiCo’s first female CEO and its first foreign-born CEO. In one of her final acts as CEO, Nooyi agreed to buy fizzy-drinks dispenser SodaStream International Ltd. for $3.2 billion, giving a company synonymous with sugary sodas a way into the homes of more health-conscious consumers. Laguarta, who is from Barcelona, will take over a company that generates more than half of its revenue from food. Plano, Texas-based Frito-Lay dominates the chip aisle, with old favorites such as Ruffles and Doritos. Salty snack foods have maintained their popularity, even as tastes change in other areas. Sugary beverages, on the other hand, clearly have lost momentum. Shoppers are pursuing healthier drinks, sending overall soda consumption to its lowest level in more than 30 years.